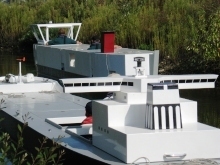 ONE of my most shameful memories, of which my sons occasionally remind me, is of a complete failure of my shiphandling abilities when negotiating a lock on the Canal du Midi in the south of France. We had hired this enormous streamlined cabin cruiser but an hour previously, and as theonly person pretending to any marine qualifications, I appointed myself master. Thus, when I completely miscalculated the miniscule stern power of the engine as we approached the first lock, graunching into the aged timbers with a horrible crash, there was none to blame but myself. I sacked myself immediately, handing over the operational management of the craft to the boys, and after a brief period of sulking, enjoyed the remainder of the week enormously. Who wants responsibility, anyway? It all came flooding back a couple of weeks ago, as I attempted to bring a 60,000 dwt panamax alongside a jetty, realising that I had overcooked my approach and that even my frantic burst of full astern would have no other consequence than to bring the bow up into the wind, with the stern coming very close to completely demolishing the facility. It is a feeling in which shame at one’s own incompetence vies with helplessness as one wonders how on earth you are ever to get out of this situation. Somehow, I think that I lack the temperament to be a pilot. At least the helmsman, bless him, didn’t laugh. We had an arrangement to be mutually supportive, and it would be his turn in command next. Lest any reader might think, even momentarily, that some owner had taken leave of his senses and allowed me to pilot a ship, I should explain that the two of us were “guinea pigs” for a new course on “shiphandling appreciation for shore based managers” at the Manned Model unit at Marchwood Lake, run by the Southampton Institute’s Warsash Maritime Centre. “You should close your eyes on the 9 m long, 5 tonnes model” urged our tutor Captain Chris Clarke, as he briefed us for our first voyage in the two-day course, “and open your eyes on a panamax”. So that’s what we did, that first day, and the 1:25 scale model Progress did preciselywhat its life-size sister would have done, albeit at five times the real-life speed. 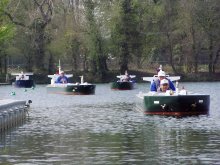 “Models focus the mind,” said Capt Clarke and over the past 25 years, the little fleet on Marchwood Lake has given that shiphandling polish to hundreds of senior ships’ officers and pilots, who have appreciated the opportunity to make mistakes without laying waste to an oil terminal jetty or a couple thousand tons of steelwork. As we cautiously began our evolutions, the “proper” ship handling course was under way with a couple of liquefied natural gas carrier senior officers, a very large crude carrier chief officer and a pilot. Watching them, you had an inkling of how focused and concentrated attention has to be, remembering those cheerful pilots who seemed to be completely unfazed when the engine refused to go astern, or the forward tug wouldn’t, and the mate down aft appeared to have gone deaf. Shiphandling is about spatial and situational awareness and it is undoubtedly a huge skill. But shiphandling skills, which I have often thought is something almost genetically implanted in some, while cruelly denied others, can, says Captain Malcolm McDougall, be taught. It is said that some 5% of shiphandlers are “natural” and “a joy to watch”, about the same number are “a danger to all” but that the other 90% can be taught to do perfectly safe manoeuvres. Time in the models is backed up with solid theory, and this is really important, because it is a strange fact that very little of this is taught for professional certificate examinations. And while pushing a wooden model around a table top in the master’s oral examination might be of limited use, it is scant preparation for that important day when you actually handle one of the world’s largest moving objects, with the potential to do all manner of expensive damage. Actually understanding what is going on with all those dynamic forces — the pressure distribution, the position of the pivot point, the effects of wind and transverse thrust — makes the reality so much more comprehensible. And the models, as Capt Clarke says, “provide the link between the theory and the real world”. Our own shiphandling appreciation course addressed what I would suggest is a very real need for shore-based managers, senior managers and people with responsibility for marine operations to have more than theoretical knowledge of the problems that are faced by those who handle ships for real. Because as you work your way through the ranks, shiphandling is something that you frequently “observe” being done by others, but that is all that happens. You could be a senior chief officer and never handle a ship, even a master of a large deep-sea vessel, always in pilotage hands in confined waters. Making a lee for the pilot and anchoring the ship will probably be the only real experience one gets. Perhaps short-sea masters, cruiseship captains and masters of specialist vessels who handle their own specialised controls might be different, but most mariners will have a career without much opportunity to exercise this special skill, unless they enter the pilotage services. I sailed with just one master who, allowed me, as second mate, to anchor the ship in an uncomplicated and uncrowded anchorage off a port in Australia, just the once and my experience would be by no means uncommon. Now there is all this concern about “the master pilot relationship” and berth-to-berth voyage planning and we expect people to suddenly embrace all sorts of new skills. P&I clubs are getting frightfully analytical, all of a sudden aboutthe incidents and expensive accidents in pilotage waters. So this appreciation course would be of enormous use to somebody who found themselves as an operational superintendent, a harbour master, somebody who needed to know whether people who were handling ships were doing a good job or not. I could also imagine a number of people who get involved when things go badly wrong, being a whole lot better informed after a couple of days sweating on the Marchwood Lake. “Wet” lawyers, surveyors, accident investigators, assessors and regulators will be better able to make their own professional judgments if they can understand the theory and practice about a manoeuvre that went wrong. Then there are those people who, from their comfortable offices, require the masters of ships to do things which they may be most unhappy doing. People who see only the desired end product, which is the ship alongside on schedule, and fail to consider the problems of the channel in the prevailing weather conditions, the depth of water under the keel, the strength of the wind and the increased risk of damage. It’s unfair, I know, but I thought about those people who have leaned on masters in such circumstances, with disastrous consequences and just wondered if they had experienced something of the reality of shiphandling, they would have been quite so gung-ho and insistent that the ship should leave the safety of the anchorage, or arrive in that difficult channel at slack low water. Perhaps its all a bit hypothetical, but it’s not that hypothetical. 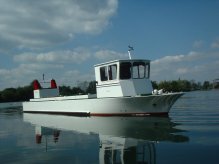 Time on a shiphandling appreciation course, which can be tailored to the particular needs of the customers, would be time well spent. The course aim: “To furnish managers within the maritime industry with an appreciation of the relevant fundamental shiphandling principles that will assist them in relating to technical aspects likely to be encountered in their management activities”, puts it better than I can, and seemed, in our case, to be well achieved. We learned about the vital pivot point, the effect of propeller and rudder, transverse thrust and the principles of berthing, turning and manoeuvring in channels and confined areas. We experienced the effects of wind, and actually experienced the effects of interaction, which is the extraordinary forces on a moving hull when it gets close to a bank or another ship. I began the course frightened to death, but while I would hesitate to suggest that I had any worthwhile shiphandling skills after all those years ashore, felt confidence rise with understanding. We went from a panamax to a VLCC and appreciated fully that “the world is a different size in different sizes of ship”. We didn’t run aground, or smash into anything, and I am proud to have even conned my ship through the dreaded “Texas Chicken manoeuvre” which is the head-on encounter endured by those who work in the Houston Ship Channel, where the pressure waves from the two ships, along with some desperate rudder movements, force them apart and keep them from disaster. We turned short around, and managed to berth the thing, without wrecking anything. 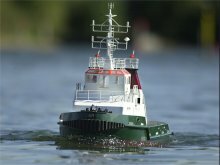 We tried bow thrusters and even employed the assistance of a radio-controlled tug. I even have a certificate to prove it all. It was a brilliant two days and I would recommend it to anyone. And while the memories are fresh, I would even have a second go at the Canal du Midi.